What Happens To Worms In The Winter? First of all, worms become "dormant" when temperatures fall below 55 degrees. They move around less, breed less, and eat less. Alive but dormant. When temps fall below 50, worms can go into survival mode. Meaning they just might crawl, creating for you, the worm farmer, a "worm nightmare". More on that later. When temps fall below freezing and stay there for several days, your worms can die. You must keep your beds from freezing or risk losing your entire worm stock. As you can see, this is one of those "pay attention to your worms" times. As promised last post, the best way to illustrate the effects of cold weather on your worms and the "nightmare" that can happen is to tell a story from my first worm farming year. On the first winter of our worm farming career, a cold front moved down early and fast. In one week, we went from record heat to a hard freeze. And it was still October. Folks in Florida aren't used to this kind of stuff, so we were unprepared. At least, as far as the worm farm was concerned. One day we were worrying about our worms frying, the next day were were trying to put little ear muffs and mittens on our worms. (I know, worms don't have hands or ears. Just making a point.) We had been warned by an old-time worm farmer about the dangers of cold weather, particularly to our worms kept in "holding trays" inside the worm house. These trays, unlike the outside beds, are more shallow and therefore more at risk in cold weather. The worm house is insulated and has an air conditioner for the summer heat (an absolute must), but we had no heat source. Thinking we might be okay because of the insulation, we fed and watered the worms, then we went to our own warm beds for the night. The next morning, when I went down to feed the worms, I opened the worm house door to a scene straight out of a horror story. Worms were literately everywhere. They met me at the door, massed in balls at the door seal. They were crawling in lonely singles up the walls. They were in squirmy balls in all four corners. They were hanging off the sides of the beds. There were worm clusters under loose pieces of tile flooring. There were individuals worms crawling across the entire floor. There were worm balls huddled here and there and everywhere. Dead and dying worms were all I could see. Everything I looked under had a wad of worms. The few remaining worms in the beds were compact balls massed at the corners. It was truly a nightmare. Next....How To Prevent This From Ever Happening Again! I feel really good that can help others avoid some of the costly mistakes I made when I first started. You'll find other solutions and prevention's for worm farming problems in my Worm Farm Manual. Increase your profits and make money quicker and easier with this Step-by-Step Guide to growing earthworms. Click here for more information. Want to start worm farming right away? Buy it now. Click for other worm growing tips. There's a serious cold front moving into parts of the country next week. This is probably a good time to take a break from the "Worm Business Mistakes" series and look at the problem of worm farming in cold weather. Cold weather can be a trying time for the worm farmer. Worms go dormant, so they aren't breeding, eating or growing as much as they do in warmer temperatures. Cold weather is also a time of great danger to your worm stock. Ever hear of a "worm crawl"? No, it's not the latest creep show down at the Multi-Plex, it's a real life nightmare that can happen for various reasons in the worm farming business. The trick is to keep it from happening and limit the damage if it does by knowing it's causes and prevention's. 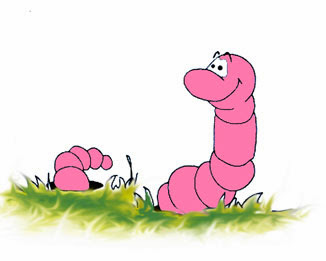 One of the biggest causes of "worm crawl" is a significant drop in temperatures. Worm beds housed in shelters that allow for climate control are protected somewhat from this danger. However, if your worm house doesn't have a source of heat or the heat goes off, your worms are still vulnerable to "worm crawl". Worms bedded outside are the most at risk. There are steps, though, you can take to prevent worms from crawling because of cold weather. The secret is understanding why they crawl, when they'll crawl, and what to do if they crawl. Although it's absolutely detrimental to their health and well-being, worms are prone to crawl out of their beds when temperatures drop below 60 degrees. If you've never experienced this "worm nightmare" before, count yourself lucky. It can be devastating to your worm business. With knowledge that the ordinary worm grower doesn't generally have, you can avoid this problem and save yourself time, money, and heartache. That's the purpose of this blog: passing along knowledge the ordinary worm grower isn't privy to providing you immunity to this and other worm farming problems. Perhaps the best way to explain a "worm crawl" is to tell you the story of my own "worm crawl nightmare." I've written my Worm Farm Manual so you don't have to learn worm farming lessons like I did - the hard way. Worm farming is a great, home-based business that the whole family can participate in together. Save yourself time, money, and aggravation - benefit from my experiences. Don't want to wait? Buy it now. To find out more about worm farming, click here. Worm Farming Mistake #5 is "Poor customer service". It's a well know fact in the business world that getting customers is hard. Keeping customers is harder. And just as important. Once someone decides to buy from you, you should treat that person like he or she was the most important person on the planet. Within reason, of course. The customer pays your bills. Don't ever loose sight of the fact that your customer is your source of income. I don't need to point out how important that little fact is. Treat them accordingly. Listen to your customers and they will appreciate it. Listening to your customers is the only way to know what they want and need. Your understanding of your customer will let you know what you need to do in order to make them happy. Keep in touch with your customers so you establish a relationship and can anticipate their needs. If you are the one keeping your customer happy and solving their problems, you'll be less likely to loose that customer to someone else. Make your customer feel important. When they call or when you speak with them in person, make them feel important by using their name, smiling (even on the phone, it comes through), and using their name. Use body language that shows your respect for them. People will appreciate it. Don't you, when your paid attention to by folks you patronize? The Golden Rule applies here, even in the worm farming business. Make sure your customers understand your business and what's expected of them. People are happy when they know what's going on and what your're procedures are for placing orders, taking payment, etc. Learn to say "Yes", within reason. If you must say "No", find a way to make it not sound like a "No". In other words, use more than one syllable, it will soften the blow. If you foul up, make a mistake, or can't give them what they want, remember to apologize. People will forgive you and be more understanding if you show concern and that you are thinking of them. Always give more than is expected. When folks get more than they paid for or get a little something extra, you will score mucho points and outshine any competition. You can learn a lot from your customers, so get their input regularly. They'll feel important and you'll learn invaluable ways to serve them better than ever. As promised, let's look at customer service as it pertains to selling worms. Once you start worm farming and the worm gets out, you'll find that a lot of people will want to bend your ear about raising worms and taking care of worms. They'll keep you on the phone forever. You'll have customers who want to start worm farming themselves. Don't be afraid to help them out, they'll be good customers for you as they stock their worm farm beds. There's such a demand for earthworms, you don't really have to worry about competition down the road. You want to answer questions and help your customers learn how to care for their worms and keep them alive. But, if you talk to everyone who calls like this, you'll never get anything done and will soon be out of business. I know, you're supposed to listen, answer questions, and get feedback. But, as stated above more than once, you have to do all this "within reason". The way to handle inquisitive worm customers is prepare a "worm care" brochure that you can email them. Make note of the most usual questions asked (there are common questions that most people ask). Answer these questions in the brochure, spell out your policies, prices, pickup times, shipping dates, etc. An information brochure is not only be an invaluable time-saver for you , it is a great customer service tool as well. When you start your worm farm business, you'll be pressed for time. Don't be tempted to ignore calls, however. Spend a little time talking and answer a few questions, especially if the caller is a customer or potential customer. Then, suggest they give you their email so you can send them your information brochure that is just chocked full of advice that will answer almost any question they could possible have. Tell them to call you back if they have any other questions or concerns that the brochure doesn't cover. This aspect of worm farming needs more attention because you'll receive many of these calls and it's a somewhat delicate balance between helping people and not getting anything done. We'll come back to this a little later. Avoid mistakes and learn how to worm farm. This easy to follow, simple guide takes you through the steps of setting up your worm farm. Tips, troubleshooting, how-to's. Get started today with your own successful, profitable worm farm. O.K. So now your worms have your undivided attention. You're lavishing constant care on your earthworms to the point your neighbors are talking and your wife and kids have left you. Well....hopefully you haven't gone that far. But, you've got them going and you're selling worms right and left. The phone is ringing off the hook and the orders of coming in. Your worms are flying off the shelves, so to speak. And you just got a huge wholesale order with the potential for repeat business. As you've learned here on the blog and in more depth in my Worm Farm Manual, worm reproduction takes a certain amount of time. And you need to keep a certain amount of worms on hand, in you worm beds, who are busy laying eggs for your future worm sales. If you deplete your worm beds too much with overzealous selling, you'll find yourself with such a reduced worm population you want be able to replace the worms you're selling. Then, when your good customers need to reorder, you'll have to turn them down. And that could cost you a customer and affect your reputation. Keep track of how many worms you have in your beds, how much you're selling and don't take on more customers than you can service. If you're getting more customers than you can handle, maybe it's time to think about expanding the number of worm beds and taking on extra help. But don't forget to thank your lucky stars. Too many customers is a problem most businesses would die for. And, quite frankly, most worm farmers often find themselves in this enviable position. There's a way to get around this worm inventory problem and fulfill all those orders detailed in my Worm Farm Manual: A Step-By-Step Guide to Raising Earthworms for Fun and Profit. Not paying attention to EVERYTHING. 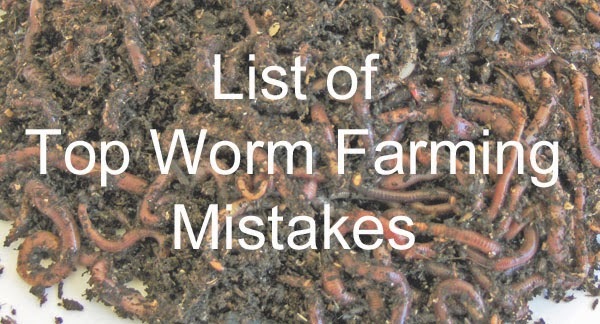 Next..... more worm farming mistakes that affect you business success. Get in business and stay in business. And make some money while you're at it! Find answers, tips and how-to's in my Worm Farm Manual. Here's a preview of what's in it. Time for a worm food question. Just received an email question this morning, so we might as well post it here in case you're wondering the same thing. Ken asked if there was a particular food that makes worms taste better to fish. He also commented that it might be a stupid question. First of all, as I told Ken, no question is too stupid to ask about worms. The more you know, the more success you'll have growing worms. As to his question about a worm food that makes worms taste better, quite frankly, I haven't heard of any. Common sense would dictate that a well fed worm, hence a more nutritious worm, will be more attractive to a fish, since all life forms seek out the most nutritious food they can find. Given the choice between a sparse meal or a fat juicy, protein packed European night crawler, which do you think a fish goes for first? One food that many think makes worms, in particular European nightcrawlers, more attractive to fish is rabbit poop. It turns the crawlers a nice shade of pink and it seems the fish are enticed by the color. At any rate, rabbit poop is an excellent worm food. Rabbits digest their food with microbes, just like horses. Worms need microbes present to digest food, and the more microbes the better. If you have a source of rabbit droppings, serve it up to your night crawlers for a highly nutritious, color enhancing worm food. 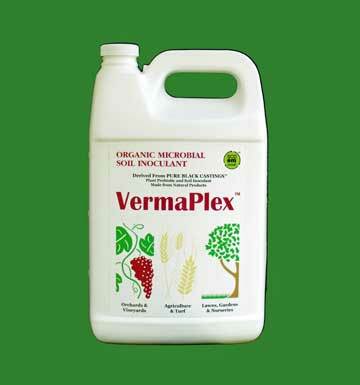 It turns out, VermaPlex®, a liquid fertilizer made from worm castings, is an excellent worm bedding enhancer. It's loaded with beneficial microbes. Add microbes every time you feed or change bedding by spritzing with a weak solution of VermaPlex® mixed with water. 1 Quart VermaPlex® Mix 1 part to 80 parts water in spray bottle. European Night Crawlers and VermaPlex® Combo More economical. 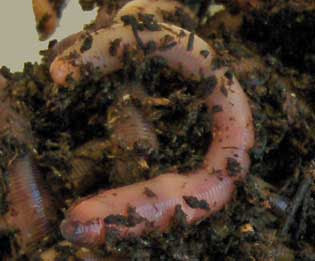 Find other worm feeding tips in my Worm Farm Manual: A Step-By-Step Guide to Raising Earthworms. Find solutions in "Worm Farm Manual"
Heard enough about earthworm facts of life for a while? Wanna talk about the real reason for worm farming? (Hint: $$$$$$). Let's face it. Most of us go into the worm farming business to make money. Right? So, what does it take to make your worm farm a successful, profitable business? 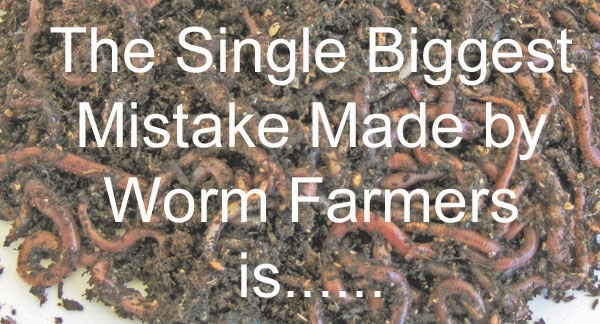 How can you avoid the many pitfalls that put most beginning worm farmers out of business. Take heart. All these problems are completely under your control. Planning and studying your markets, prevention and addressing problems early are the keys to avoiding these worm farming pitfalls that take so many worm farmers to the poor house. Stay tuned. I'll expand on each of these worm farming business problems next. Feel free to post in the comments your thoughts or questions you may have about worm farming. Find more worm farming problems and their solutions in my Worm Farm Manual. Novice and established worm farmers alike can benefit from this step-by-step guide to successful worm farming. Click now to discover just exactly what's in it. 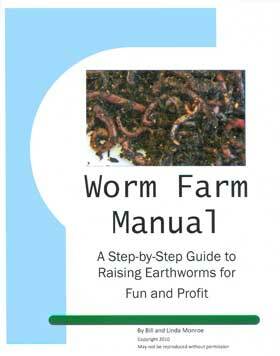 Discover other worm production tricks - Worm Farm Manual. Shall we continuing our discussion on "the birds and the bees" of worms? The process by which worms fertilize their eggs and deposit them is not only fascinating, it also leads us to today's tip on how to get more eggs per capsule. And more eggs means your worm population builds quicker. So, all this extra knowledge on earthworm reproduction really is going to pay off. If you'd rather just cut to the chase and get right to the Worm Tip, scroll on down to the bottom of the post. But, if you want an understanding as to why the tip works, keep reading. You'll get to the tip eventually. For such a seemingly simple creature as the earthworm, their breeding and fertilization process is a little complicated. We've already discussed the fact that worms are hermaphrodite, each possessing both male and female "equipment". The sperm and ova are located in separate segments at the top, or anterior, end of the worm. During mating, each worm receives the sperm of the other through the connected clitellum (described in the last post). This transferred sperm is then carried away by muscular contractions and stored in each worms' "seminal receptacles", where it awaits the maturation of the ova. The fact that the ova mature at a slower rate than the sperm is why fertilization takes place at a later time, not at the actual "magic moment". Once the ova begin to ripen, the egg laying process begins. The clitellum forms a mucus ring that moves forward, passing over the segments where the ova are stored, picking up ripe ones. The ring then moves over the seminal receptacles where the sperm is stored and picks up the sperm deposited by the worm's mate. Fertilization now occurs in this mucus ring. The mucus ring, filled with fertilized eggs, continues to move over the worm's head. As it leaves the worm, each end of the ring pinches off, forming the egg capsule or cocoon. This capsule, filled with a nutritious fluid, is then left in the bedding, usually near the top. These egg capsules are a greenish-yellow after being laid and turn darker as time goes by. At time of hatching in 14-20 days, the worm capsules will appear dark brown or purple. The size of the capsule depends largely on the size and maturity of the worm doing the laying. The number of eggs per capsule, however, depends on the amount of time the ring takes to move over the worms body. "To get more worms per worm capsule, keep your worms well-fed and in loose bedding." Have all the (nutritious) food your worms can eat, available to them all the time. "Turn" your beds (i.e. toss and stir it up) once or twice a week to keep the bedding from becoming packed down. Change out the bedding when it gets too dense and refuses to stay loose between turnings. Discover more tips and how-to's in my Worm Farm Manual: A Step-by-Step Guide To Raising Earthworms For Fun and Profit. A complete guide to earthworm production business.. In the world of worm farming, there's no such thing as too much information. The more you know, the fewer problems you will face and the more worms you can grow. Earthworms are hermaphrodites, meaning each individual worm possesses both male and female reproduction "equipment". This remarkable capability means each worm may produce offspring from a single close encounter. Even more remarkable and astounding (though I'll admit rare): it is possible for a single worm to fertilize itself. No wonder earthworms have survived for so long. When earthworms become mature, they become banded. The clitellum is part of this band and is where worm babies come from, so to speak. Take a look at the picture above. If you ever see this in your worm bed, please leave them alone. If you have to be in the worm bed for some reason, be very careful when handling worms in this... uhh... formation. When earthworms are breeding, they are very vulnerable to damage, particularity the clitellum. If the clitellum is damaged, the worms will probably die and/or won't be able to reproduce. Next time....what happens and what comes next. Back the our hypothetical worm bed. The sale of bait-sized European Nighcrawlers has the highest profit potential of all the worm markets. Selling bait worms retail is the highest price you can get. Let's say you're near a lake and the traffic to the lake goes right by your worm farm. Hallelujah! You have a gold mine. Once you sell to even one fisherman, there will be a deep and well worn path to your door from other fishermen coming to the lake. You can sell your worms cupped or better yet, fill their containers, at a price that is very good for you but still better than any bait shop could possible offer. But even if you don't have this prime location, if you're anywhere near a good fishing area it's still possible to sell to this market. It's just not the "sit-in-your-rocking-chair-and-rake-in-the-money" situation. You'll have to put out just a little more effort to reach your market. So, whatever your proximity to the fishing holes are, you have a ready market for your bait sized worms. Let's say bait shops in your area are lucky enough to have a source of European Nightcrawlers, the best bait worm on the planet, and they sell them at $4.oo a cup. You could sell your worms at $3.50 per cup. Usually, you put 24-30 worms per cup. One pound of good sized bait European night crawlers makes about 10 cups, so you would be getting $35 dollars per pound. with your 180 pounds of worms per bed per year, you could get $6300 per bed . One 3'x8'x1' bed of European night crawlers, sold as retail cupped bait, can produce $6300 per bed per year or $262.50 per square foot per year. From these figures, you could put in 10 beds (which is very doable and rather small scale). These ten worm beds, stocked with European night crawlers and sold retail as cupped bait, ....well....you do the math. Find out how to get the maximum growth and production from your European night crawler bait worm beds. My Worm Farm Manual walks you through setting up your beds, feeding your worms, harvesting your worms, and selling your worms. Grow European night crawlers, the best darn bait worm on the planet. How Much Money Can You Make Per Worm Bed? Q: How much money can I expect to earn per worm bed? A: That depends. How big is your worm bed? How many worms is it stocked with? Are you selling as retailer, wholesaler, or "grower"? To simplify, let's take a hypothetical situation and put some numbers out there. To begin, let's take one worm bed with the dimensions of 3 feet wide, 8 feet long, and at least 12 inches deep. This 24 square foot bed is fully stocked to the maximum capacity to achieve optimum breeding with 4,000 bed run worms or 1000 mature breeder worms per square foot or about 100 pounds of worms for the entire bed. Now, this amount of worms is considered crowded growing conditions. Which is why a bed so stocked must be harvested of mature worms at least every 30 days. (To grow your business, you can divided as well as harvest on a 60 to 90 day cycle. Build additional beds, each of which could produce the yields of our worm bed under discussion here). You should expect to harvest about 180 pounds of earthworms from the above hypothetical worm bed per year. You are also stocking new worm beds as the year goes along. Once these new beds are filled, you can receive the same production from each bed. Each of these new worm beds will produce and refill other beds and so on until you run out of room and/or time. At this point, you can buy more land, hire more people, or keep it small enough to handle yourself and sell off the excess worms to other aspiring or established worm farmers. Worm Farm Manual: A Step-By-Step Guide to Raising Earthworms for Fun and Profit. Can you convince worms to grow bigger? Can you trick them to be as big as they can be? Answer: You bet. So what's the secret? You're feeding your worms all they can eat. You're checking the moisture, temperatures, air flow, and ph of your worm beds excessively. You are HOVERING. Yet, your worms only seem to grow to a certain size and that's it. Well, take heart. Here's a simple, easy-to-do tip for making your worms grow bigger, all other things being equal. Buy, beg, borrow or steal a small number of the biggest worms you can find. Larger worms are usually a night crawler of some kind: native night crawler, European or African. Or, you may have a breeder bed or other bed that you have a good number of larger worms. Take the big boys and put them in with your puny boys (and girls). Something will happen that is almost magical. In about 2-3 weeks, the smaller worms will grow as big as the biggest worms in the bed. This naturally occurring mechanism is called "homomorphous development". In Nature, many life forms can grow as large as the largest in order to compete for food and space. Worms have this ability and has given rise to the myth of "hybrid worms". The California Striper, Red Gold Hybrids, Red Hybrids, Egyptian Reds, Super Worm, and other so called "hybrid worms" you see advertised are just some basic earthworm like the manure worm or red worm that has been "super-sized" by throwing them in with some monsters. Try this easy trick and see if you can't create your own monsters. Another trick is to apply a diluted spray of VermaPlex® to your new bedding and every time you feed. The added microbes will make your worms happy. And a happy worm is a big worm. Buy 1 Quart VermaPlex now. Find other worm growing tips and how-to's in my Worm Farm Manual: A Step-by-Step Gude to Raising Earthworms for Fun and Profit. While we're on the subject of how many worms to stock into your worm beds, let's talk about "propagation" boxes or worm breeding beds. You want to stock your worm breeding beds differently than your worm growing beds. If you want to accelerate your worm farm production quickly with less cost, you should get starting breeding your own worms right away. You could just let nature take it's course and let the worms do their own thing at their on pace, but you can speed things up. and it will have a positive effect on your bottom line. Breeding boxes can be built out of wood or they can be plastic bins. They should be approximately 14 inches wide, 18 inches long, and 6 inches deep. If you have several breeding boxes, you can stack them to save space. Just make sure there is a space for air to circulate around each bed. For ease of handling, I built shelves that I could slide the trays in and out without having to pick them up and move them about, sort of like a chest of drawers. Believe me, you want to make this as easy as possible because you will be working these beds daily and you don't want to have a system that requires a lot of stacking and un-stacking. The inexpensive plastic shelving from home building stores are good for storing your worm boxes, too. The best material that meets all the requirements for worm bedding is horse manure, properly aged beyond the heating up stage. It is loose, porous and has the lowest possibility of causing "protein poisoning". It great for breeding boxes as well as growing beds. Now, everyone may not have access to this wonderful stuff (and to the wonderful creatures who produce it), so there are alternatives. A good option is plain Sphagnum peat moss. It's clean, is holds moisture, and it stays loose. But because peat moss has an acid ph when dry, you must moisten it moss 24-36 hours before introducing any worms. This moistening will reduce the acid to the correct level. The downside is peat moss bedding is it must be changed out every 14 days. Check the bedding moisture closely. The shallow boxes will dry out quicker. Feed a highly nutritious commercial worm food (like FRM Cricket and Worm Food). Important: Feed only as much as the worms will eat in a day. Clean off any uneaten food before adding more or before turning the bedding. Turn the bedding frequently to keep the bedding loose and fluffy. Maintain a constant temperature of between 60-70 degrees. Keep the new bed of capsules and babies undisturbed except for watering and occasional feeding as needed. In about 90 days it will be full of maturing earthworms. When it get crowded, divide it, pull out any mature breeders, or put it into a bigger growing bed. Follow this worm breeding plan and you'll soon have more worms than you can shake a stick at. Find many more tips and how-to's on growing earthworms in my Worm Farm Manual. This is another worm farming question that comes up often: How many worms can I put in my worm bed? The answer: Well, it depends. How big is your worm bed. Do you want to make vermicompost - fast. First, measure your worm bed(s) and get the square footage (for the mathematically challenged, length times width). Your growing beds should be at least 18" deep. (More on "propagation" boxes later.) Generally, you don't want more than one pound worms per square foot . Go by poundage rather than count, because who can count worms? Who wants to? Who has the time? Poundage is more accurate and meaningful, anyway. Larger worms weight more, so there are fewer worms per pound. Smaller worms weight less, so there are more worms per pound. A pound of worms is a pound of worms so far as how much food is consumed and how much space is taken up with worm bodies. If you're raising worms to sell as fish bait, you'll want to stock your bed with enough worms so that they can find each other and make babies. If you have too few worms, they could wander about aimlessly forever and never find true love. Bottom line: keep them close enough to reproduce. Learn a whole lot more and then some on this subject and other worm growing tips: Worm Farm Manual - A Step-By-Step Gude to Raising Earthworms for Fun and Profit. Emphasis on profit. That makes it fun. Find out more about worm beds : "Worm Farm Manual"
Option 1, provide shade, can be locating your worm beds under shade trees. A word of caution on certain trees that can be harmful to worms. Leaves from citrus, bay pine, fir, oak, cedar, black walnut, sequoia or eucalyptus tress contain aromatic oils, tannic acid, and resinous saps that are harmful to earthworms. The worms can either grow sick, die, or crawl away. If you do locate your worm bed under one of these trees, you must keep the leaves out of the bed. While we're at it, leaves make good worm food. But you should avoid leaves from the above mentioned trees for obvious reasons. Leave your comments or questions about your worm beds below. Worm Farm Manual: Step-By-Step Guide to Growing Earthworms. 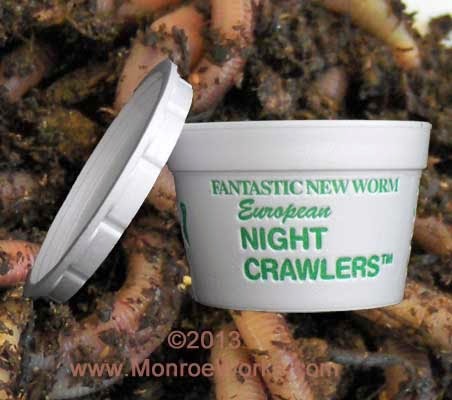 European Nightcrawlers: Start growing the best darn fishing worm on the planet. Find answers to worm growing problems: "Worm Farm Manual"
A fellow in Michigan sent in an email question today concerning his worm bed. He grows worms for his fishing needs in a tote in the ground. Apparently, he had grown worms successfully for three years, but decided he needed more fishing worms for family members. There are some things I don't know about the new worm bed, but from the information I do have, there are several reasons for worms to disappear. If the peat moss was added straight to the worm bed without first moistening it and letting it sit for 24-36 hours, the ph would be too high and the worms could either crawl away or die. If the new worm bed was placed in the sun and the temperatures went up, the bedding would become too warm and the worms could, again, either crawl away or die. If the bedding became too wet, the worms could, you guessed it, crawl away or die. If the bedding became too dry (the heat), say it with me now, "the worms could either crawl away or die". If the worms weren't getting enough food (a water melon rind per week isn't enough for worm production), the worms could, (this is sounding like a broken record, but), crawl away or die. If there was no light placed above the new bed once the worms were relocated, the worms could (one last time) crawl away and (likely) die. Thanks for the email, Worm Grower in Michigan, and good luck. If you have any worm growing questions or problems, email them or post in the comments section below. European Nightcrawlers: Start growing the best fishing worm. "How much food do I feed my worms so they are happy and grow? I need to figure the cost of worm food for my worm farm business? According to C.A. Edwards' "Biology of Earthworms", worms can eat 80 mg of food per 1 gram of body weight. When calculating your worm food amounts, go by the approximate weight of your worm population, not the count (it's sorta impossible to count worms anyway). There are 453.5 grams in a pound, so for each pound of worms, you should feed at least 36280 mg (or 36 grams) of worm food. For maximum profit, try to find free worm food, at least in the production stage. The fattening stage will require grains like FRM Cricket and Worm Food, and will be your greatest expense. The best worm food for fastest worm growth are manures and the best manure is horse. Lucky for you, horse barns pay people to carry off their endless supply of manure (there's always more coming!). Horse barns and stables can be found even in cities, so get out there and find yourself some free worm feed. There are many other worm feeding tips as well as how to set up your worm farm, how to grow earthworms, and troubleshooting tips in my Worm Farm Manual: A Step-By-Step Guide To Raising Earthworms. Order today and get started growing earthworms. European Nightcrawlers: One tough fishing worm. You could be the exclusive source in your area. Worm Farm Manual: See what's in it. Just one tip can save you valuable time and money. This blog is all about providing information to help you grow worms and keep your worms healthy. In that spirit, I need to pass along some information about a particular manufacturing byproduct that some have used to feed their earthworms that has turned out to be rather deadly. Cotton Gin Waste As Worm Food - NOT! It may be free, but using waste product left over in the processing of cotton as worm food is not a very good idea. As it turns out, due to the fast array of pesticides and chemicals used in the growing and processing of cotton, this waste product will most probably kills your worms. It has been documented that cotton cultivation uses more pesticide than any other crop. And test have shown that the chemicals remain in the cotton trash for over a year. Unless you can find an "organic" cotton source (and there is a demand for organically grown and processed cotton products), avoid feeding cotton gin waste to your worms. A little reminder: When introducing a new kind of feed to your worms that you've never used before or don't know anyone who has used it, either DON'T or pull out a small number of worms as a test. Feed these worms the new feed and observe them for any signs of sickness, crawling, balling up, or death. This test may have to last for a long period of time before any adverse signs make an appearance. It's just not worth the risk of killing or making your worms sick. When they're dead, they're dead. Check out one of this blogs pages, "Worm Feeding", for more do's and don'ts.